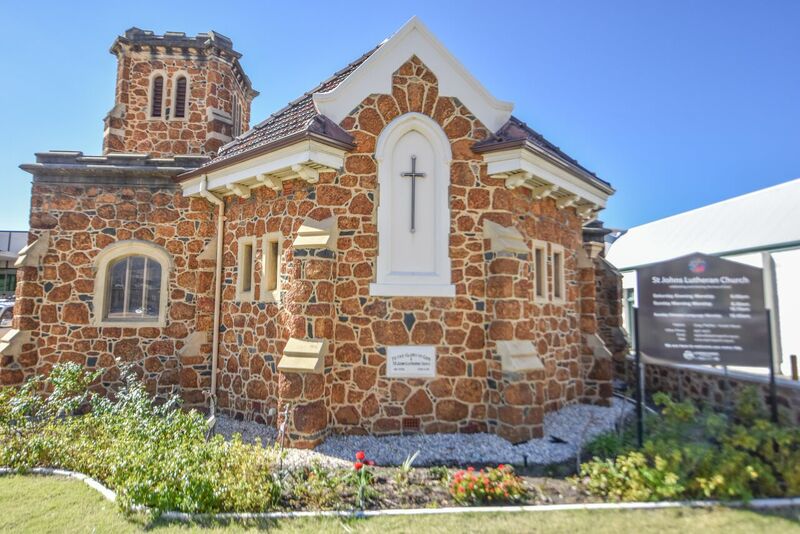 St John’s Lutheran Church was the first building in Perth to be constructed of laterite stone. Erected in 1936, the church used brown stone in varying shades which had been quarried in Darlington and stored for nearly a decade. German Lutherans had been arriving in Perth since the late 19th century, mostly from South Australia, with more coming from gold boom of the 1890s. The first Lutheran church was established in Fitzgerald Street in 1902. In the 1920s, further German immigrants expanded the Perth Lutheran congregation, and it became obvious to the leaders of the congregation that the building in Fitzgerald Street was no longer adequate for their needs. A more central location for a “modern church” was proposed in Aberdeen Street. Hugo Fischer and his family began quarrying laterite at their property at Darlington, storing it ready for the commencement of building. Spanney drew new plans for a church in 1934, which had a nave without side aisles, and intended to accommodate 200 worshippers. Features of the church were a chancel, sanctuary, organ chamber, font alcove, sacristy and “an attractively detailed bell tower”. This was more like a traditional Anglican church than a Lutheran church. In 2006 adjoining land was purchased to increase the size of the block and a project started to raise funds for an adjoining development with both commercial and community facilities. This was completed and officially opened in 2014. Today, St. John’s Lutheran Church continues in use as a church, with most services in English, and a monthly service in German. During World War I, people of German descent were required to register as “enemy aliens”, and many were interned. There was widespread hostility towards members of this community. While members of the Lutheran church continued to meet, services in the German language were discontinued. Some members of the congregation moved away. At Kalgoorlie, the congregation disbanded in 1914, and the Fremantle church was vandalised. Following the war, some detainees and their families were deported. In the 1920s, further German immigrants expanded the Perth Lutheran congregation, and it became obvious to the leaders of the congregation that the building in Fitzgerald Street was no longer adequate for their needs. A more central location for a “modern church” was proposed, and architect Richard Spanney drew up plans for a building in the Inter-War Free Classical style on the corner of Museum and Aberdeen Streets. However, these were not implemented at this time. In 1928, 16 Aberdeen Street was purchased for £1,600, as the site for a church. However, the existing building was let as a boarding house through to 1935, whilst funds were raised for a new building. Hugo Fischer and his family began quarrying laterite at their property at Darlington, storing it ready for the commencement of building. In 1930, the Lutheran church at Fremantle was closed and sold for £1,000, the proceeds of the sale put toward the Perth project. Spanney drew new plans for a church in 1934, this time in the Inter-War Gothic style. The nave was designed without side aisles, and intended to accommodate 200 worshippers. Features of the church were a chancel, sanctuary, organ chamber, font alcove, sacristy and “an attractively detailed bell tower, with the main entrance at its base”. This was more like a traditional Anglican church than a Lutheran church, and it is possible this was deliberate to rid the perception of St John’s as being only for Germans. Some members of the congregation were critical of the size of the proposed church, doubting that there would be a need to accommodate 200 people. There was also some opposition to the choice of laterite for building the church, as it was hard to work and had not been used previously in Perth. To demonstrate the use of the stone, a trial wall was built at Fitzgerald Street in mid-1935, by stonemason B. McAndrews. The single storey building is constructed of random laid laterite from Darlington on the exterior faces, and ‘bagged’ bricks on the interior, with a roof of terracotta tiles. The timber altar and pulpit were brought from the earlier building in Fitzgerald Street to the new church, and also the hymn boards. Members of the congregation were given the opportunity to purchase a pew at the new church. Although the outbreak of World War II brought a renewed period of hostility towards people of German descent the post-war era saw the number of German-born residents increased to more than 5,000 by the mid-1950s. Significant numbers of immigrants from Latvia, Estonia and Finland were also Lutheran. A church hall was built in 1986 following a land swap for the construction of the Graham Farmer Freeway Tunnel. In 2006 adjoining land was purchased to increase the size of the block and a project started to raise funds for an adjoining development with both commercial and community facilities. This was completed and officially opened in 2014. Today, St. John’s Lutheran Church continues in use as a church, with most services in English, and a monthly service in German.